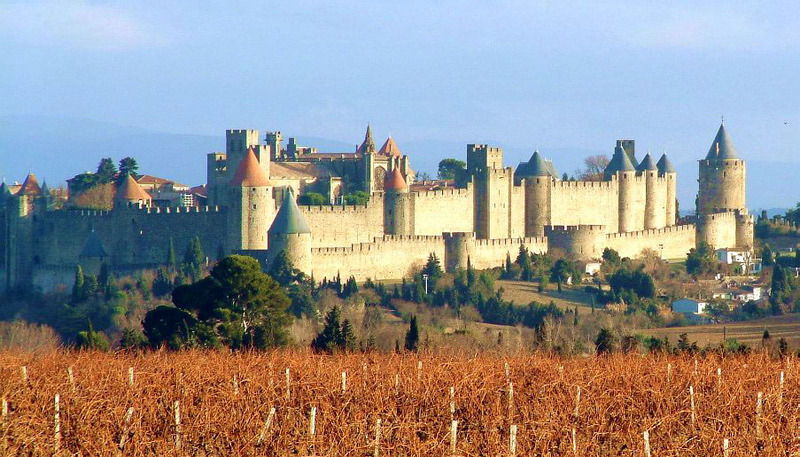 Carcassonne is home of two UNESCO World Heritage sites. La Cité de Carcassonne is the largest fortified medieval city in Europe and one of the most well preserved. It receives over 3 million visitors each year, and it’s only a 0.6 mi (1 km) walk from Maison Juliette. The Canal du Midi is a 17th century canal that runs from the Mediterranean to the Atlantic. With 86 locks over 150 mi (240 km), the canal required 10,000 laborers working for 15 years to complete. It’s now the most popular pleasure waterway in Europe. The tree-lined paths offer great walking and cycling, and you can rent a canal boat for a long-distance trip. 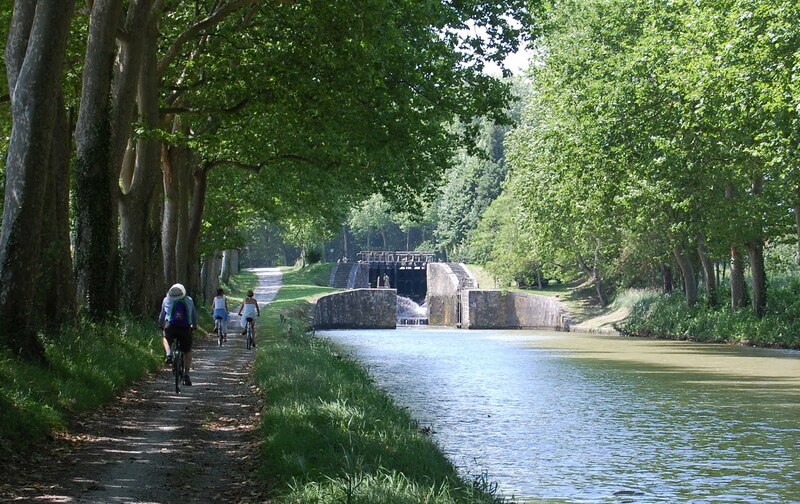 The Canal du Midi is only a 0.3 mi (500m) walk from Maison Juliette. Carcassonne is also a wonderful, relaxing small city, where you can sample the pedestrian-centered lifestyle of the French. Walk to the bakery for croissants every morning, relax at a cafe mid-afternoon, and enjoy a glass of wine outside in the garden with dinner. Fly to Paris and take the TGV (high-speed train) to Carcassonne. Fly to Toulouse and either rent a car or take the 1-hour train to Carcassonne. Fly to Barcelona and either rent a car or take the 3-hour train to Carcassonne. Fly RyanAir from Brussels, London (Stanstead) or other UK airports directly to Carcassonne international airport. You can also combine strategies 1 and 2: fly into Tolouse, then take the TGV to Paris and fly out of Paris, for about the same cost as a round-trip airline ticket. Maison Juliette is just 2 mi (3 km) from the Carcassonne airport. There are several rental car agencies at the airport, and cabs are available to the house for just 10 euros. Maison Juliette is only 0.5 mi (700m) from the Carcassonne train station. If you arrive with rolling bags and aren’t too tired, you can simply walk to the house. There’s also a cab stand outside the train station. Carcassonne’s climate is beautiful all year, with 300 days/year of sunshine, an average annual temperature of 58°F (14°C), and just 23 inches (600mm) of annual rainfall, mostly in the form of afternoon showers. Dec-Mar: high temperatures of 50-58°F (10-14°C), occasional frost at night, sunshine 40% of daylight hours, and 18 days/month without any rain. Apr-May: high temperatures of 62-68°F (17-20°C), sunshine about half the daylight hours, and 16-18 days/month without any rain. June-Sep: high temperatures of 75-82°F (24-28°C), cooling to 55-60°F (13-16°C) at night, sunshine more than half the day, and 20-23 days/month without any rain. Oct-Nov: high temperatures of 58-68°F (14-20°C), sunshine about half the daylight hours, and 19 days/month without any rain. Check out our annotated Google map showing nearby shops and restaurants, nearby tourist destinations, favorite restaurants, and more. See how much is within walking distance – you really don’t need a car! Maison Juliette is located in the center of Carcassonne, with the medieval walled Cité 0.7 mi to the east, the Canal du Midi 0.3 mi to the north, and Carcassonne’s commercial center 0.5 mi to the west. 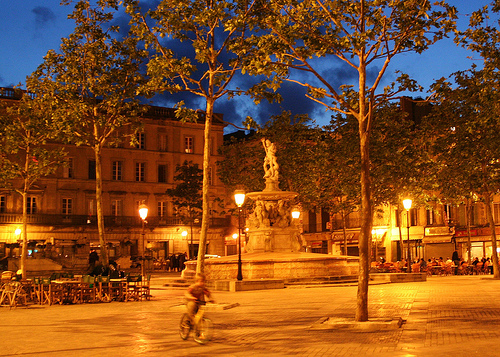 Place Carnot, Carcassonne’s central square, is a 0.6 mi (1km) walk from Maison Juliette. Within a 0.5 mi walk, you’ll find numerous restaurants and bakeries, two grocery stores, many ATMs, a theater, several museums, and the Carcassonne train station.